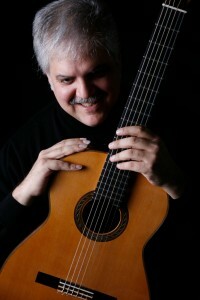 I am committed to bringing the highest level of excellence and talent to the classical guitar program at UNLV. I have dedicated my entire life to performing, recording and teaching music. They are inextricably linked. This year I have accepted an unprecedented seventeen freshmen. Among them is a nationally ranked soloist, a resident award-winning guitar quartet, and a diverse group of uniquely gifted students from our local high schools. Together with the UNLV Foundation, I have initiated a guitar scholarship to assist students in achieving their artistic and professional dreams while pursuing a degree at the College of Fine Arts. Many of our exceptional students come from working families in Las Vegas and qualify for Nevada’s Millennium scholarship by maintaining a higher GPA during their high school journey. The purpose of the guitar scholarship is to help finance the cost of tuition while these students complete the requirements for a degree in music. In addition, the UNLV guitar scholarship will help recruit top national and international students who will represent UNLV on the world stage now and in many future seasons. Student must complete an online FAFSA Application. I invite you to join me and the UNLV Foundation in this noble endeavor. Your gift represents a precious investment in our young scholars, exceptionally talented musicians, and future community leaders. I look forward to hearing from each and everyone of you and I am grateful for the opportunity to work in this magical city. Give Securely Online at the UNLV Foundation. Please choose the “Classical Guitar Scholarship” in the Designation drop-down to ensure your donation goes to the appropriate area.